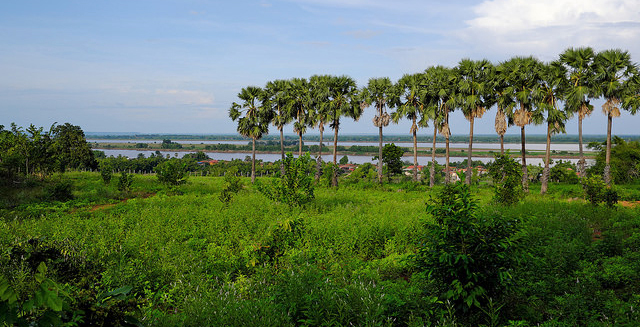 Opportunities for landscape architects to work in Cambodia are very much thinner on the ground than for, say, agricultural scientists or hydro-engineers. Whatever your discipline however, expect an emphasis on sound, practical skills: in the third world built results are what count, not necessarily elegant design solutions. Buddhism for Social Development Action (BSDA) for whom I work, provides education, vocational training, health education and health services (mainly in connection with HIV infections) for the seriously disadvantaged from east to west Cambodia. The central aim is to empower people to take more control of their own lives. I was taken out to several projects during my first week, it’s a tough world out there, particularly when both of your parents die horribly in the same room as you when you are aged between 5 and 15. In order to reduce their dependence on foreign funding, BSDA are building a high-level meditation centre and retreat aimed at well-heeled “wellness” tourists. The retreat is planned to concept design stage as a multi-building complex on a steeply sloping, 5 ha site, and no one in the organisation has any experience at all of building at that scale, which is where I come in. The buildings are all low-tech structures using bamboo and compressed clay bricks sourced on or near the site and I am responsible for the extensive terracing, setting out, site design including planting, and general supervision of the workforce, which is resident on site. We are using direct labour in preference to contractors, to ensure that the money we spend flows into the local economy and not out of the region, this requires a robust site presence. We have a team coming from Thailand who are to teach our team to build “beautifully” with bamboo, instead of just nailing it together: Cambodians have a history of using bamboo primarily for cheap structures with a short life span such as shelter for livestock or seasonal bridges, and have therefore given little thought to the development of sophisticated joints. 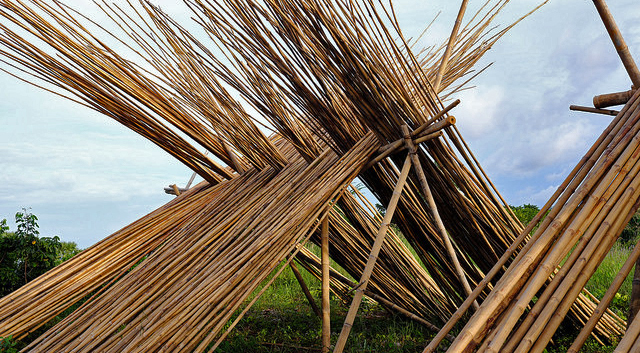 The Thais have long used bamboo for permanent structures and it is this culture that we intend to tap into. Our proposed meditation hall – made entirely from bamboo – is based on the lotus flower and has a diameter of 17 meters and a height of nearly 7 and will be a challenge for us all. For my work – which extends often late into the evening and weekends – I get a room to live in, three meals a day, a large motorbike to get around on (the site is 28 km out of town) and a copy of AutoCad 2007 on my laptop. Equipped with these tools, some steel pegs, a long line and a 10 m tape measure I am currently setting out the site. As soon as I am finished in one corner, holes are dug and foundations are poured, although I am continually trying to prevent them doing this until I have substantial areas finished with, because my levels of accuracy are very compromised by a lack of basic equipment: anyone want to donate a theodolite? Why do I do this? Firstly, I can afford to because I have a 30 year, paid career behind me. Most volunteers here though are in their late twenties, own nothing and are doing it for the experience. Secondly, I am doing it because working in a country is to see it and learn it in a way which it is quite impossible to do as a tourist, and Cambodia interests me. Thirdly, I like the work and I like the challenge and I very much like living in the tropics. And, fourthly, this is unique CPD that may well lead to other things, I may have a long career behind me, but I wasn’t intending to simply do nothing yet. This is an investment for my future. And yes, it does help too that I can fully support the aims of the BSDA and their particular brand of engaging with economics, this has unfortunately not always been the case with my employers. Some people pay to volunteer, how much of your money stays local, or even in your country of destination is often very questionable. Others arrange their work before they get here, I think this is probably the majority. Others, like me, simply turn up and get lucky (communal areas in cheap hostels coupled with a willingness to open conversations with strangers are two good starting points). The deal I have with accommodation, food and means of transport is fairly typical and if you expect the quality of a cheap backpacker hostel then you won’t be disappointed when they show you your room. If you are keen to eat simple local food wherever you go and are unfussy, you will look forward to your meals. If you have full trust in yourself and your guardian angel you will love driving your “moto” (or, what is often more troubling, riding pillion on one) on barely existent country “roads”. Many people in my organisation volunteered first and then got a paid job after 6 months or a year, but on salaries below US$ 1,000/month you might have a comfortable life (in Cambodia) but won’t be putting too much away for the future. My ex-pat colleagues – not just those in the BSDA – are from Taiwan, China, France and Japan and those not simply just passing through as tourists or the terminally shy can expect to quickly make interesting social contacts and be incorporated into group activities: this is very rewarding. Indeed, it is as much what happens outside of work that makes volunteering in the third world so satisfying.